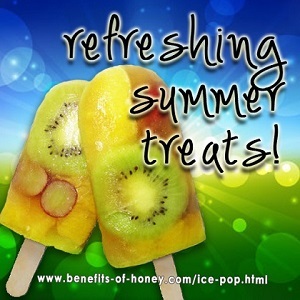 How about an all-natural fruity ice pop for a refreshing summer treat? The following recipe is the result of being inspired by an awesome-looking fruit popsicle in Pinterest. It was really exciting figuring and putting things together this way, all based on pure imagination of how the popsicle should be made. You can vary the flavor of the ice pops with any other possible varieties of fruits eg lime, soursop, mango, guava, etc or even experiment with the different distinct monofloral varietals of honey. Combinations of different honey and tea can yield very different results in terms of flavor and taste. 1. Arrange slices and pieces of cut fruits such that they lean against the walls of the ice-pop moulds. This will determine how pretty your popsicle is going to look. 2. Stuff and pack the remaining fruits into the centre of the moulds. This will not show up on the outside of the popsicle. 3. Pour honey water/tea mixture slowly into the moulds until it reaches the brim. 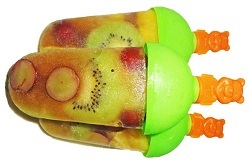 Make sure saps and spaces in between the fruits are filled up with the honey water, otherwise there would be holes on the popsicles and the popsicle will break easily. 4. Freeze for at least 8 hours. End of "Fruity Ice Pop Recipe" . Back to "Delicious Honey Recipes"